Yoshoku-ya has been a busy place every time I have passed by but have never gone in myself, probably more for the fact that I can make these kinds of dishes myself at home. I’ve been hearing though that Yoshoku-ya is a better representation of this cuisine than Ping’s offering. Look forward to hearing your thoughts if/when you get there. There’s another place I know of (Japanese run and operated), but its in Richmond, and called Bonqula (http://s1.shard.jp/bonqula/index.html). They have yoshoku items on their menu like curries, doria, gratins, katsu, croquettes, etc. There is also Barefoot Kitchen in Davie Street, near English Bay; though this is more on the low end (none of the dishes “as is” were over $12). Shokutsu, Thanks for the heads up on Bonqula. Their menu looks interesting (looks like they bake their own bread too). I will be checking it out. KimHo, Barefoot sounds like a good lunch spot for me to try. Thanks for the info. I had similar feeling as you guys after going to Yoshoku-Ya….Omurice is what I make on weekend mornings to use up leftover rice, and the other items were not exactly gourmet. There’s still good reason for this place to be popular however, much like Denny’s is to some crowds. hahah, my friend loooooves Japanese Denny’s. She showed me the site once and it looks so much nicer than our Denny’s. I wish I’d tried it while I was over there. Yes, the fresh baked breads was another selling point I forgot to note here. Anyone know a place that makes it with demiglace sauce? holly, are you referring to something like in this? Yesss. I loved that drama. 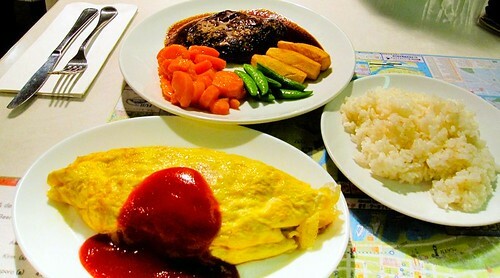 That”s exactly where I first learned about omurice and I want to eat it on this side of the ocean. btw, I just tried a japanese fusion restaurant today in Richmond called BonQuLa. It’s a wierd name but well worth the experience. Most lunch dishes/combos are $10 but come with all sorts of side dishes, which I love. It’s located in a strip mall on Alexandra road and was furnished quite nicely with some quirky touches. I ordered the teriyaki ground beef patty and it was delish. It came on a hot plate with thin crunchy potatoe strings and some cabbage and sprouts on the side. Included in my combo set was a miso soup (which tasted homemade and not out of a box), extremely light, melt-in-your mouth, tempura which came with some green tea powder for dipping (cool), rice topped with seaweed bits, bamboo shoot side dish, and if that wasn’t enough, a complimentary dessert of ice cream/cornflake/coffee jello (I know, strange, but it worked). The servers were polite and attentive. I also tried a bag of the homemade bread which the chef bakes daily. There were interesting combinations like green tea, onions, cheese, etc. This restaurant was definitely a labour of love and you could see the attention to detail in everything. For only $10, I enjoyed every bite. The only shame was that there wasn’t more patrons. This is a real hidden gem which I will definitely be coming back to. If you’re interested, the address is #165-8460 Alexandra, Richmond, BC. I totally agree with you that the place was ‘a labour of love’ as you can tell just from the details in the dishes. I’ll be paying them another visit soonish and hopefully write a post that will do them justice. Hi! I came across your blogs while researching on Vancouver restaurants and do want to say the I have been going to Bonqula since they opened a few years … the owner/chef, KAORI, does a great job in keeping up the quality of her food even though they are not busy most of the times. Do also go back and try Bonqula’s dinner courses because those are excellent value for the price.